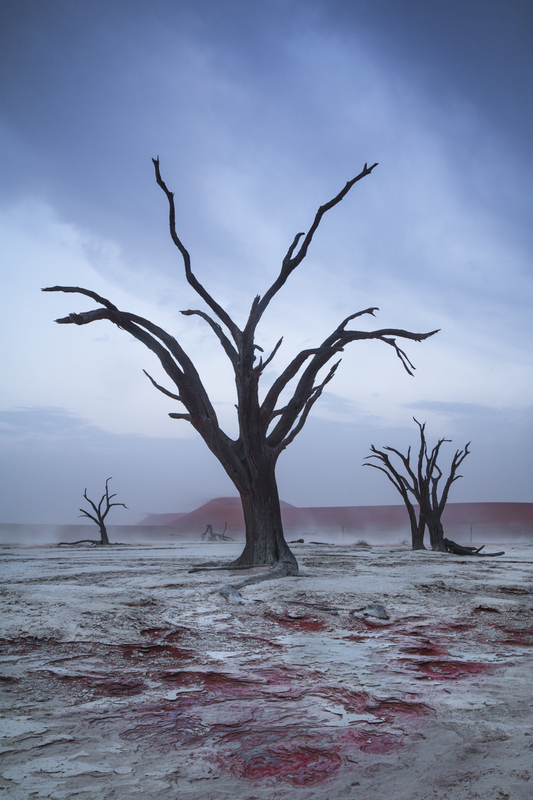 Deadvlei is a white clay pan located in the middle of the Namib Desert formed after the Tsauchab river flooded. This event creating temporary shallow pools where the abundance of water allowed camel thorn trees to grow. When the climate changed, drought hit and sand dunes encroached on the pan, blocking the river from the area. 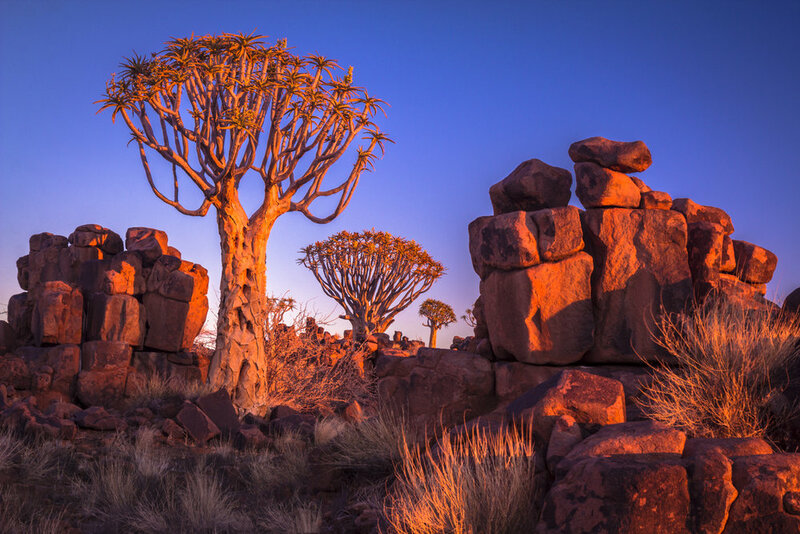 The remaining skeleton trees, which are believed to have died 600–700 years ago, are still standing because the desert is too dry to allow the wood to decompose and their bark is black from the scorching sun. This area is almost always sunny and cloudless but the following photographs depict what the area looks like under cloudy weather and through the haze of a windy sandstorm, both of which create awesome menacing moods. The Sossusvlei area is surrounded by some of the tallest sand dunes in the world, the highest reaching 300–400 meters (350m on average, named "Big Daddy" or "Crazy Dune"), which rest on a sandstone terrace. The dunes are most beautifully lit in the morning and evening light when dramatic side-lighting accentuates their curves and height. I absolutely love the sweep of the sand and white minerals in this classic Namib Desert scene. The harsh light accentuates both the tall dune and the tree to the left. The quiver tree is an alien-looking specimen that can live to reach two to three hundred years in age. They grow in patches throughout the Namibian landscape and are sacred to the local bushmen peoples. My visit to this area was timed during the growing winter season when bright yellow flowers begin to appear on their branches. These photographs are captured in and near an area called "Giants Playground" due to the large granite boulders stacked in blocks around the trees. 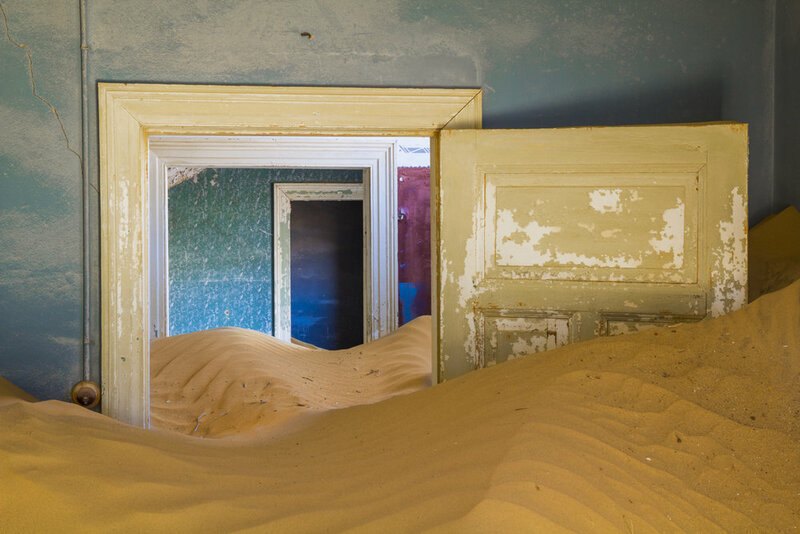 Kolmanskop is a ghost town in the Namib Desert built during a diamond mining boom and quickly abandoned as its diamond field was completely depleted. 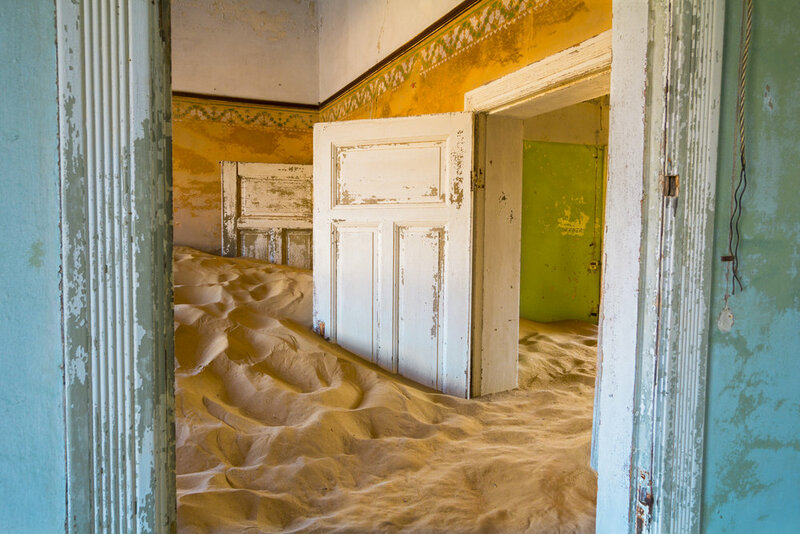 Over the last century, strong winds pushed the abundant Namib sand into the houses and rooms through doors and windows. 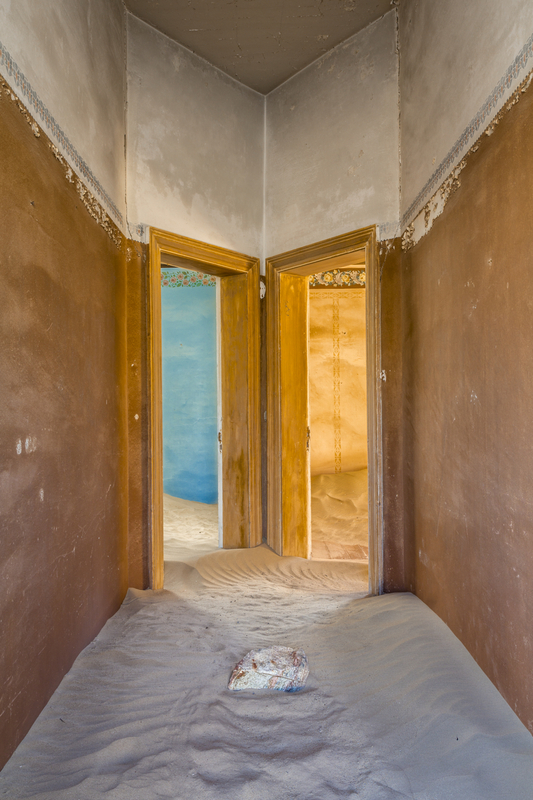 The desert here is so dry, that the wood does not decompose and the colorful wallpaper remains largely in tact. The wildlife photographic opportunities in Erindi Private Game Reserve are endless. This 70,719 hectare park of pristine wilderness in central Namibia is rich with some of Africa’s most beautiful creatures and landscapes. Since 1998, careful management of the park has ensured the recovery of the ecological balance between vegetation, herbivores, and predators. This success has increased the numbers and diversity of species, leading to sustainable land utilization and socio-economic benefits for all in the area. 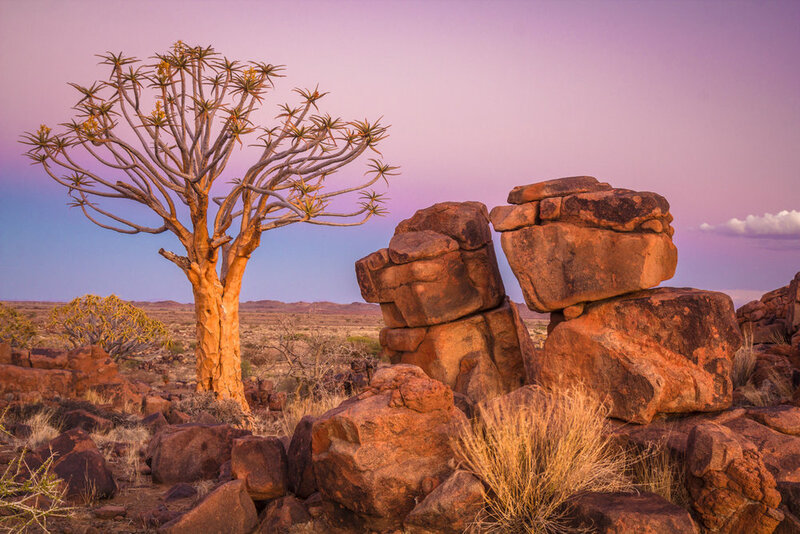 Spitzkoppe is a series of granite peaks in the Namib desert that are estimated to be more than 120 million years old. The highest outcrop rises about 1,784 metres (5,853 ft) above sea level and they stand out dramatically from the flat surrounding plains. This composition was scouted by my tour leader, Ryan Dyar, and a few of us took turns shooting the rock crack, which points to the dual upright rocks during a warm sunrise.